The Department of Surgery, Obafemi Awolowo University Teaching Hospitals Complex, Ile-Ife, is the hospital arm of the Department of Surgery, Obafemi Awolowo University (formerly University of Ife) which was one of the earliest Departments established in the College of Health Sciences, then Faculty of Health Sciences; when the (then) University of Ife came into existence in 1962. Since then the Department has been in the forefront of provision of qualitative and affordable surgical care to patients from South Western Nigeria as well as patients from other parts of the country. The Department has developed progressively in terms of manpower and can boast of experienced Specialist Surgeons in virtually all disciplines of Surgery-in¬-General. The feat of the first Renal Transplantation to be undertaken by a Team of Indigenous Surgeons in any Public Institution in this Country was successfully carried out in this Department in May 2002. Till date eleven successful kidney transplantations have been carried out in this Department. Similarly the separation of Siamese twins has been successfully carried out on different occasions while successful cochlear implantation has been performed repeatedly in the otorhinolaryngology unit. The ophthalmology unit has continued to practice modern techniques like the small incision cataract surgeries and is developing the Vitreo-Retinal Surgery unit. With over 300 laparoscopic surgeries performed since 2009 and a wide range of diagnostic and therapeutic gastrointestinal, respiratory and urological endoscopic procedures performed on routine basis, the Department has blazed the trail in minimal access surgery and surgical endoscopy. All arrangement is being made to commence open heart surgery in the Department in the next few months. Many lecturers in the Department are External Examiners and Visiting Professors to other Medical Schools in the country and a number serve as Examiners in the Postgraduate Medical Colleges. The Department of Surgery of OAUTHC is in the forefront of deployment of endoscopy services in surgical practice across Nigeria. The pioneering role of Professor Anthony Arigbabu in developing a gastrointestinal endoscopy unit in OAUTHC, Ile-Ife, received world-wide commendations. His efforts led to the establishment of unit that trained several generations of Nigerian gastroenterologists in diagnostic and therapeutic endoscopy. His ingenuity and proficiency led to his world acclaimed description of the use of flexible colonoscope for the reduction of sigmoid volvulus. Today, the Endoscopy Unit in OAUTHC is one of the busiest in the country with routine deployment of endoscopy for diagnosis and treatment of both upper and lower gastrointestinal conditions. The Hospital also offers routine Respiratory and Urological endoscopic services. Again, the Department of Surgery OAUTHC is the leading public tertiary hospital in Nigeria with regards to kidney transplantation. The transplant unit of the Department has not only carried out successful kidney transplantations in Ile-Ife, it has also been involved in assisting other tertiary hospitals in Nigeria in carrying out similar operations. The greatest challenge to this programme is the availability of individuals who are willing to donate a kidney to save the life of another individual. While this is not a problem in other climes, many in our society still shy away from such kind gesture due to certain beliefs. Whenever these kind donors are available for those in need of kidney transplantation, OAUTHC is the place to be for successful operations. The following have been carried out with success in both the donors and the recipients. Obafemi Awolowo University Teaching Hospital Complex (OAUTHC) Ile-Ife, successfully performed 12 open heart surgeries as well as 14 closed heart surgeries in 2016. This year (2017), the cardiac surgical team has performed 7 open heart surgeries and 5 closed heart surgeries. 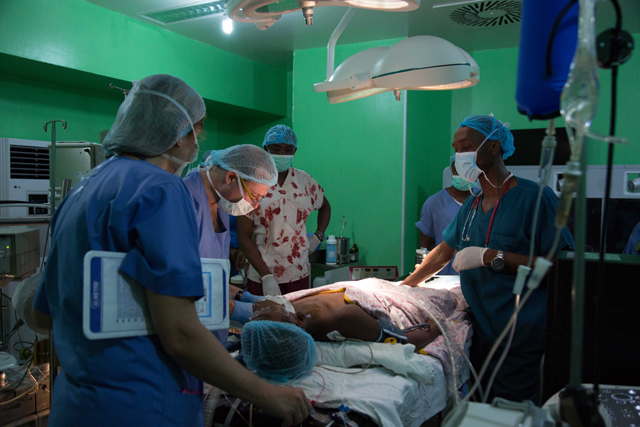 The surgeries this year included the repair of a 10-month-old boy with Type 1A truncus arteriosus, the very first successful repair of truncus arteriosus in Nigeria. The success story of the surgical operations were achieved based on the competence of our cardiac surgical team and cardiology unit who work in very close partnership with the International Congenital Heart Centre of Sheba Medical Centre, Israel to provide world- class care at very low cost.